This Three days Chitwan Jungle Safari Tour Package from Kathmandu will provide you an adventurous opportunity to explore the various endangered wild species at UNESCO Natural World Heritage Site, Chitwan National Park in the southern part of Nepal. This is one of the popular jungle safaris tour in Nepal among Nepalese as well as for tourist. If you would like to involve yourself in nature, walk in a dense forest, see elephant breeding center, ride an elephant and see the wild animals then Chitwan Jungle Safari is the perfect tour for you. 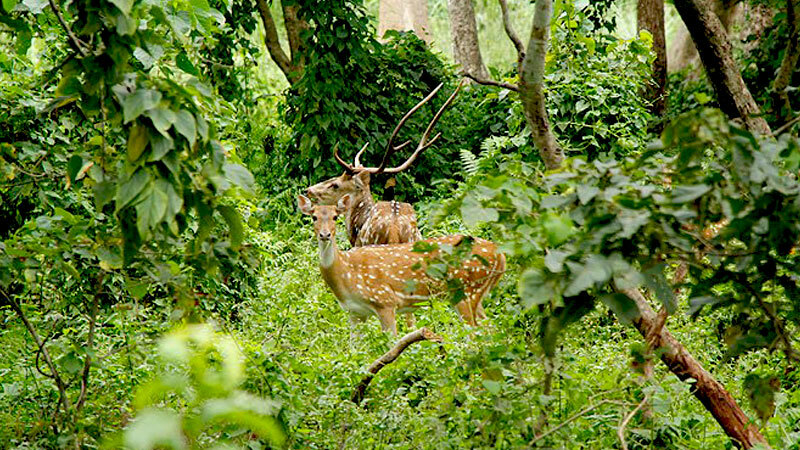 Formerly known as Royal Chitwan National Park, this forest is used to be the wild hunting jungle to the previous rulers of Nepal. The park is spread on 930 square kilometers in the flat Terai lowland of Nepal. The forest of Chitwan has touches four districts, Nawalparasi, Parsa, Chitwan, and Makwanpur of Nepal. It inhabits 700 species of wildlife like crocodiles, gharials, Bengal tiger, leopards, sloth bears, golden jackals, fishing cats, jungle cats, one horn rhinoceros, 543 species of birds and many more. Sauraha is the main tourist hub of Chitwan and covered with lots of resorts, restaurant, and souvenir shops. It is 172 km in distance from Kathmandu and takes around 6 hours by private vehicle. Every day lots of luxurious tourist buses depart at 7 am from Kathmandu Tourist Bus Station to Sauraha. Most of the resort provide pick up services if you have booked the package.in advance. 1 night 2 days, 2 nights 3 days, 3 nights 4 days packages are available for the traveler. Two nights and three days package is the most popular among these. Bharatpur airport is the nearest airport to get into Chitwan National Park. Every day there are several flights available from Kathmandu and Pokhara. The flight takes around 20 minutes to reach Bharatpur airport. The journey to the most famous jungle begins with a six hours drive from Kathmandu following the Trisuli, Marshyandi, and Narayani River. Trisuli River is the famous for rafting, grading plus three and plus four. You can also participate in rafting and re-join the tour. After having lunch at the resort, move to visit the nearby Tharu Village to experience their lifestyle and culture, and in the evening enjoy the Tharu Stick Dance program in the hall. Next day will be the jungle activities like canoeing trip, jungle walks, elephant breeding center visit, elephant back safari, bird watching program, and many more. After completing the Chitwan Jungle Safari tour, either drive back to Kathmandu or divert to Pokhara. Day 01: Drive from Kathmandu to Sauraha (Chitwan National Park). Day 03: Drive back to Kathmandu. Breakfast at hotel. Around 9 am you will be driven back to Kathmandu. Then, transfer to your hotel. Our 3 day Chitwan Jungle Safari Tour finished here! Kathmandu to Chitwan and back by private vehicle. Everyday breakfast, lunch, and dinner at the hotel. Twin bed sharing hotel accommodation at Chitwan. Wants some modification on Chitwan Jungle Safari Tour itinerary? contact us to customize it.